NCCN guidelines recommend that smoking cessation be provided as part of oncology treatment. According to the guideline, the most effective strategy is to combine behavioral therapy with pharmacologic therapy. 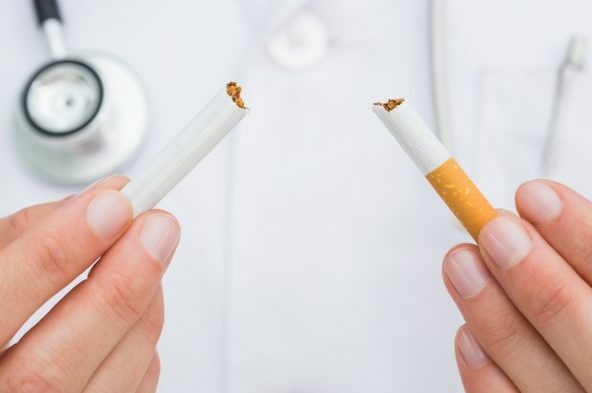 Behavioral therapy plus nicotine replacement therapy (NRT) or varenicline are recommended for 12 weeks; extended therapy beyond 6 months may be necessary. Bupropion is recommended as an alternative therapy if cessation is not achieved with NRT and varenicline. Relapse, slips, and multiple quit attempts are common before successful cessation, and this behavior does not necessarily indicate a need to switch therapy. Health care providers should continue to provide guidance and support during relapses and slips. The NCCN recommends using behavioral therapy in addition to NRT or bupropion. The NCCN recommends the combined use of fast- (ie, gums, lozenges) and long-acting (ie, patch) formulations. Used singularly, the long-acting patch (OR, 1.91; 95% CI, 1.71-2.14), the short-acting gum (OR, 1.68; 95% CI, 1.51-1.88), and other short-acting formulations (OR, 2.04; 95% CI, 1.75-2.38) were effective in increasing the odds of quitting. Their combination, however, increased efficacy by nearly 3-fold (OR, 2.73; 95% CI, 2.07-3.65). Common adverse events (AEs) of NRT are primarily related to the route of administration. The patch, for example, can cause skin sensitivity and irritation; gum can cause hiccups, gastrointestinal disturbances, jaw pain, and orodental problems; sublingual tablets can cause hiccups, burning in the mouth, sore throat, coughing, and dry lips. There may be a small increase in the risk of palpitation and chest paints with NRT use. The Cochrane review found a rate of 2.5% with NRT compared with 1.4% with placebo (OR, 1.88; 95% CI, 1.37-2.57) in data from 15 trials. There is, however, insufficient evidence to suggest an increased risk of cardiovascular events or cancer.